The first supernatural Ghost Rider is stunt motorcyclist Johnny Blaze, who, in order to save the life of his mentor, agreed to give his soul to "Satan" (later revealed to be an arch-demon named Mephisto). At night and when around evil, Blaze finds his flesh consumed by hellfire, causing his head to become a flaming skull. He rides a fiery motorcycle and wields trademark blasts of hellfire from his skeletal hands. He eventually learns he has been bonded with the demon Zarathos. Blaze starred in the series from 1972–1983. The subsequent Ghost Rider series (1990–1998) featured Danny Ketch as a new Ghost Rider. After his sister was injured by ninja gangsters, Ketch came in contact with a motorcycle that had somehow been mystically enchanted to contain the essence of a Spirit of Vengeance. Blaze reappeared in this 1990s series as a supporting character. In 2000s comics, Blaze again became the Ghost Rider, succeeding Ketch. Nicolas Cage and Matt Long played Johnny Blaze in the 2007 film "Ghost Rider". Cage reprised the role in the sequel "Ghost Rider: Spirit of Vengeance" in 2012...More about Ghost Rider Character Review...keep reading !! 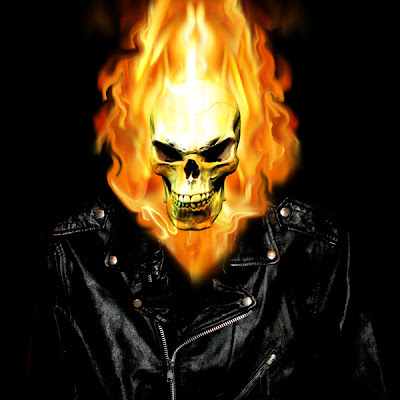 The Ghost Rider is a human who can transform into a skeletal being with a flaming skull and supernatural powers. The motorcycles he rides can travel faster than conventional motorcycles and can perform such seemingly impossible feats such as riding up a vertical surface, across the surface of water and leaping across great distances that normal motorcycles could not match. The Ghost Riders are notoriously hard to injure by any conventional means, as bullets and knives usually pass through them without causing pain (knives are seen to melt while in their body). It is possible that they are genuinely immortal; it is said that God created them and only God can destroy them. The Ghost Riders possess superhuman strength, enough to easily pick up a truck and hurl it across a road. It has been stated that Johnny Blaze as Ghost Rider can press around 25 tons (or more as seen in World War Hulk). But a Ghost Rider's powers are more of a curse until they learn to control it. 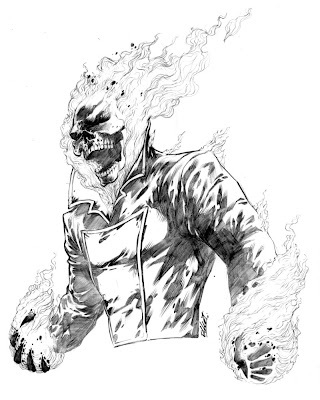 Johnny Blaze – Originally when Blaze transformed into Ghost Rider, his body changed but not the clothes he was wearing. In his new incarnation, this is different and his clothes take on a darker, more sinister appearance with a spiked leather jacket and chains. As Ghost Rider, he can cause his motorcycle to transform and surround itself with hellfire or he can create a new cycle from pure hellfire. He is also capable of projecting hellfire as a weapon. Hellfire "burns the soul" without leaving physical injuries on the victim and its effects have been seen as similar to the "Penance Stare." In his new incarnation, Blaze is now possibly the most powerful hero on Earth. During "World War Hulk" it was stated by Dr. Stephen Strange that Ghost Rider might be equally as powerful as the "Green Scar" persona of Hulk and could possibly defeat him. However, Ghost Rider is defeated and Johnny Blaze knocked out. Zarathos himself then emerges and rides off because (as Dr. Strange stated) Ghost Rider protects only the innocent, which none of the Illuminati are. 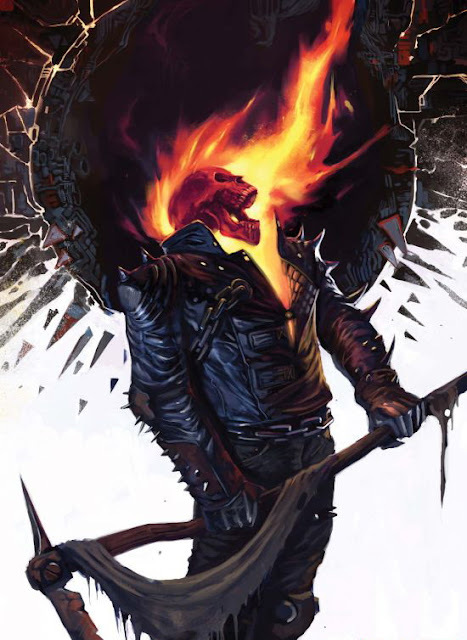 In recent comics Blaze's Ghost Rider has been given the "Penance Stare" and mystical chain, both of which were specific to the Danny Ketch Ghost Rider. Blaze also uses a shotgun and discovered that he can discharge hellfire from the weapon when he first encountered Ketch. He also now has new abilities including hellfire breath and the ability to produce chains from either his throat or chest. He is also now able to travel between the incorporeal realms. Daniel Ketch – When Ketch transformed into Ghost Rider, his clothes changed with him, taking on the appearance of a spiked leather jacket with chains, gray leather pants and spiked gloves and boots. Likewise, his motorcycle underwent a radical transformation, changing from a conventional into a high-tech motorcycle (This transformation was not strictly limited to the motorcycle he found in the cemetery as he was once seen to be able to transform another cycle in "Ghost Rider/Wolverine/Punisher: Hearts of Darkness"). Along with flaming wheels that allows the bike to nearly fly across surfaces, the bike included a shield-like battering ram on the front. As the Ghost Rider, Ketch used a mystical chain which responded to his mental commands. It could grow in length, alter direction while in the air, stiffen into a staff or spear, and separate into several links which can strike like shrapnel and then return to their original form. Daniel's most famous power was the Penance Stare. By locking eyes with a target and mentally focusing, the Danny Ketch Ghost Rider was able to make the target experience all the pain they had ever inflicted on anyone else. This ability was seen to have little effect on some people who were mentally unstable (such as the being known as Madcap. Ghost Rider was also knocked out when attempting to use the Penance Stare on Carnage). Originally, this incarnation of the Ghost Rider could only be summoned if Danny was present when "innocent blood was spilled" (an innocent simply being threatened was not enough), at which time Danny had to touch the gas cap of his motorcycle for the transformation process to occur. Later, he was able to summon the Ghost Rider without touching the gas cap, but still needed to wait for innocent blood to be spilled. Later still, he was able to summon the Ghost Rider by willpower alone. 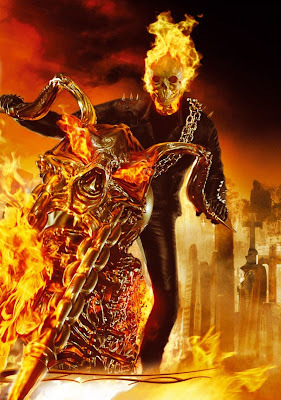 On February 16, 2007, Columbia Pictures released the movie Ghost Rider, starring Nicolas Cage as the adult Johnny Blaze and Matt Long as a teen. The character faces Blackheart and his father, Mephistopheles. Nicolas Cage reprised the role in a sequel, Ghost Rider: Spirit of Vengeance, released February 17, 2012, in 3-D. Here the character is recruited by a sect to save Danny Ketch from being possessed by the demon Roarke.